Mini Break in Lucerne - Time for a nice cup of tea? So yesterday we went to Lucerne for a belated Birthday celebration for mr.ncot. 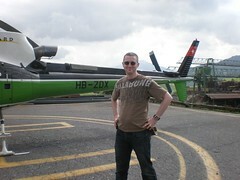 I had bought him a helicopter flight over central Switzerland, which he really enjoyed. And here's me and the bump looking gorgeous on the balcony! You really look gorgeous on that picture! I am taking the laptop into hospital, but either me or mr.ncot will post a quick update prob. late Friday! It's great to see you two these very special days. Have fun!